As someone who has been to two theme parks in her whole life, I don’t know much about rides. Honestly, the last time I went was when I was in my mid-twenties. I felt like the oldest woman ever. I gamely went on all the rides that my companions wanted to go on, but I had my scarf wrapped tight around my neck to stop my head from flying off. Since then I’ve accepted that I’m too much of an invalid to go on rides, so naturally I have no interest in theme parks. When planning my Copenhagen trip, I came across Tivoli Gardens and thought the idea was sweet – but honestly, if it weren’t for the fact that they had a Christmas Village, it wouldn’t have occurred to me to go there. I knew I was going to enjoy it when walking towards Tivoli you could hear screaming. Not stupid, teenage girl ‘I’m-screaming-for-attention’ sort of screaming, but ‘hell-this-is-insanely-scary’ screaming. It shouldn’t have been, but it was very funny to hear – especially on the rollercoaster, when the scream literally whizzes past you, rising to a crescendo above your head and then disappearing into the darkness. Fantastic. Now, I went in December 2016, and having looked at their website, I can see that there are lots of new, exciting things they’ve added this year. However – I had such a fantastic time, I really want to share my trip, just in case it sways someone to go along. And Tivoli is many things for many people. It’s a theme park: it has rides and roller-coasters. It’s a fair: it has carousels and bumper cars. It’s a concert hall: there are classical and modern concerts. It’s a theatre: it holds frequent comedy and ballet performances. There are shops selling reindeer skins, shawls, Christmas sweaters – there are food places to suit restaurant goers and those who just want some churros. And there are actually gardens at Tivoli Gardens. Oh yes. No false selling here. And, as the second oldest theme park in the world, there’s history. So as you can see it has, quite literally, something for everyone. Arriving after dark, on a cold evening, all the colourful lights from the park twinkled in the crisp air. It looked magical, like an enchanted world full of unexpected delights and undiscovered corners. There were patches that were very busy and it was sometimes hard to see what was going on around you, but there was also a wonderfully relaxed atmosphere, so having the crowds wasn’t actually creepy or (too) annoying. There were lots of tourists and teenage groups, but there were also lots of families and people of all ages. The magic of Tivoli is not exclusively experienced by one group and that made everything seem that much more perfect. The history of Tivoli is really interesting. It was set up in 1843 by Georg Carstensen, who was inspired by the parks and gardens he’d visited during his travels abroad – which is why its original name was ‘Tivoli and Vauxhall’, alluding to the famous parks in Rome and London respectively. He went for the theme of the exotic Orient – perhaps partly inspired by the fact that he’d grown up in the Near East – and set up a theatre, band-stand, cafes, restaurants, gardens as well as rides. In the evenings, he arranged for coloured lamps to illuminate the park and firework displays were planned so as to reflect in Tivoli’s lake. Carstensen was obviously a savvy businessman, because after the initial awe-inspiring experience that greeted the first visitors (he had a roller-coaster that lasted seven seconds!) he made sure that he kept everything fresh and regularly introduced new gimmicks. One of these was the introduction of the Tivoli Boys Guard, which has since become an iconic feature of Copenhagen. His business savvy is also proved by the fact that just two years after the park opened, Carstensen introduced a season pass – though of course you couldn’t get one unless you were a man, so as a woman you had to be tagged onto a fella’s pass or just sneak in with the girls on single tickets. Another clever move by Carstensen was his choice of musical director – Hans Christian Lumbye worked at Tivoli from its opening until 1872, and became known as the Strauss of the North. Many of his compositions are still played at Tivoli, and since the gardens inspired many pieces, it’s rather lovely to have that continuation. Unfortunately, after five years Carstensen decided to enlist for the army during the war against Prussia, so he was forced to leave Tivoli. After his time in the army he went to the Danish West Indies (Danish Antilles) and then he spent some time in New York before returning to Copenhagen. He tried to create a rival to Tivoli and began the project of building the Alhambra (in the Moorish style, naturally) – but he died before it was completed. 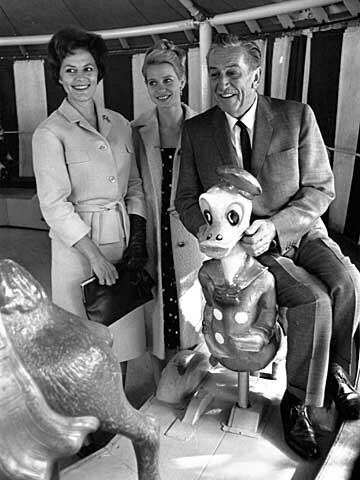 What seems really appropriate is to have another savvy businessman, Walt Disney, seeing the magic of Tivoli. Disney travelled around Europe and America visiting parks while he was planning his own project – but what he apparently wanted was to capture the atmosphere of Tivoli in Disneyland, California. I have never been there so obviously I don’t know if it does – I’d like to find out! I think it’s very revealing that when Disneyland opened in 1955, Disney gave a speech and said “Here age relives fond memories of the past, and here youth may savor the challenge and promise of the future.” When I was trying to understand why the Tivoli atmosphere was so joyful, I couldn’t really put my finger on it, but this quote explained it, because this is what it does. There is a sense of nostalgia, of a memory of those childhood fantasies that you wished were real… the colours, the lights, the movement all trigger something wistful but happy at the same time. As adults, we are condemned to live quite flat lives – places like Tivoli don’t just remind us of something we’d forgotten, but they also fulfill that need to actually experience the magic too. And to see children caught up in the joy of the moment, creating real memories, doing activities which let them believe they are almost grown up, builds on the magic and the beauty of the experience. There wasn’t anything in particular worth highlighting about a trip to Tivoli – just walk around and enjoy the experience in the way that suits you. If you like mulled wine, the Danish glögg is extremely warming and nicely alcoholic – but also good for you, because they add raisins and almonds to the mix, so you can eat some of your five-a-day at the end of the cup. Engraved above the stage in the Peacock Theatre are the words: “Shared joy with the people”. What a wonderful sentiment and how perfectly it fits the magical world of Tivoli. There’s also an app available for Apple and Android which is rather useful – it tells you what events are coming up as well as just making navigation somewhat easier. Tivoli has special events during Halloween and Christmas, but note that they aren’t open again till spring, so be sure to check on the website before planning a trip. Plenty of what’s at Tivoli is aimed at children of all ages – certain rides have height limits, but everything is pretty clearly explained. If you want to be prepared, the website gives all the information about each of the rides, so you know what you’re doing.